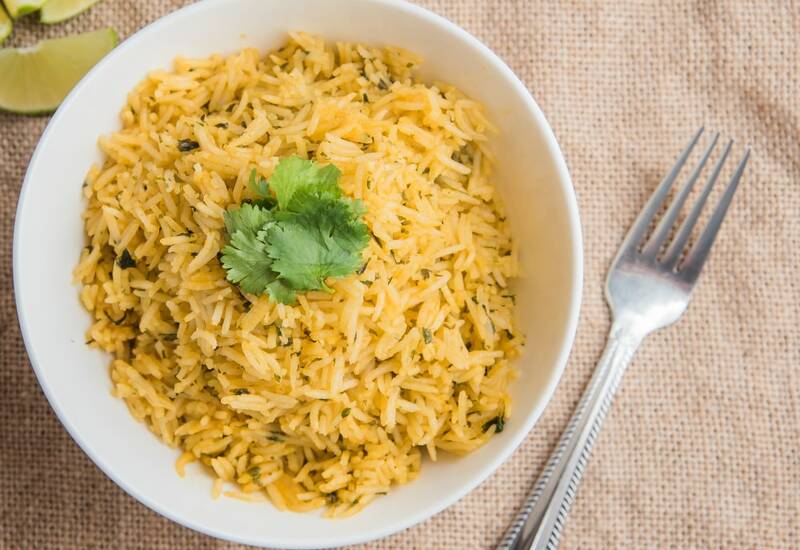 This simple rice recipe delivers perfection every time! It's a zesty side dish with only five ingredients that plays well with just about every main course. Start with long grain rice and soak it in cold water for about 20 minutes, then drain. Ghee is melted in a saucepan and then fresh cilantro and the drained rice is added. The rice quick toasts in the hot pan before chicken stock is added and brought to a boil. The rice simmers until it is tender. A squeeze of fresh lime is the final flourish before serving! To make this dish vegetarian, use vegetable stock instead of chicken stock. Ghee can be purchased in the grocery store, or you can save money by making it yourself. If you don't have ghee, you can substitute butter. The flavor will be slightly different, but equally as delicious! Per Serving: 115 calories; 4g fat; 15.2g carbohydrates; 3g protein; 11mg cholesterol; 130mg sodium. This is almost too easy. Get a lot of flavor with minimal effort. Second time I made it, I doubled the lime, because I love lime. I know the flavor combination is classically understood to be Mexican, but this side really goes nicely along almost any protein and simple vegetable side. Seriously give it a go. Great simple rice with the addition of chicken stock. Pairs very nicely with a grilled chicken breast or shrimp (which I tend to gravitate towards often). Added some chopped garlic because, why not? I also made some cheese enchiladas with a four cheese sauce that worked deliciously. I added black beans to this and mixed it in with some chicken. Very good and healthy meal!